YOU WILL ALWAYS CHERISH THE SEA: a new video is born! I’M GLAD TO ANNOUNCE THAT MY NEW VIDEO “YOU WILL ALWAYS CHERISH THE SEA” IS SCREENED FROM TODAY WITHIN THE EXPO “Ici et là-here and there/Les grands magasins”! OPENING TODAY AT 5PM!!!!! JE SUIS HEUREUSE D’ANNONCER QUE MA NOUVELLE VIDEO “TOUJOURS TU CHERIRAS LA MER” EST VISIBLE à PARTIR D’AUJOURD’HUI LORS DE L’EXPO “Ici et là-here and there/Les grands magasins”! VERNISSAGE à 5H!!!!! SONO FELICE DI ANNUNCIARE CHE IL MIO NUOVO VIDEO “AVRAI SEMPRE A CUORE IL MARE” è VISIBILE DA OGGI NELL’AMBITO DELLA MOSTRA ”Ici et là-here and there/Les grands magasins”. APERTURA OGGI ALLE 17H!!! 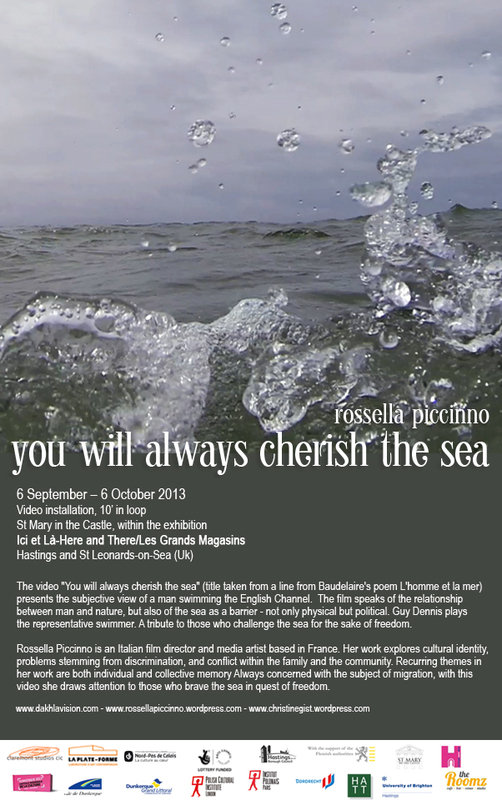 The video « You will always cherish the sea » (title taken from a line from Baudelaire’s poem L’homme et la mer) presents the subjective view of a man swimming the English Channel. The film speaks of the relationship between man and nature, but also of the sea as a barrier – not only physical but political. Guy Dennis plays the representative swimmer. A tribute to those who challenge the sea for the sake of freedom. Rossella Piccinno is an Italian film director and media artist based in France. Her work explores cultural identity, problems stemming from discrimination, and conflict within the family and the community. Recurring themes in her work are both individual and collective memory.lways concerned with the subject of migration, with this video she draws attention to those who brave the sea in quest of freedom. From 25 August through 6 October 2013, eleven artists will be working in Hastings & St Leonards creating temporary interventions inspired by the unique coastal landscape and maritime activities of the area. The artists are based in various mainland Europe port and coastal locations in the South East of England, Italy, France, Belgium, the Netherlands, Germany and Poland. The project has been initiated for Dunkerque 2013 Regional Capital of Culture and Hastings is the only UK location to participate in this major cultural tourism event. Artist/curator Christine Gist has developed Ici et Là-Here and There in partnership with Claremont Studios, St Leonards-on-Sea and Dunkerque artists’ group La Plate-Forme. In November/December 2013, the project becomes Les Grands Magasins as the artists will take over empty shops in Dunkerque’s town centre. Ici et Là-Here and There populates locations outside a gallery context with the interventions finding niches in disused outdoor sites, redundant municipal buildings, art project spaces, music venues, the beach and obscure parts of the built environment. The artists’ interventions sre research-led and as such have emerged from encounters with the local community, the town’s social and architectural heritage and the pervasive influence of the sea, ensuring that the works create a dialogue with the places they inhabit. Ici et Là-Here and There raises questions rather than offering definitive answers. How do the artists’ experiences of ‘living on the edge’ impact on their practice and how is this articulated in a cross-cultural context? Are artists who live and work on the littoral more responsive to global connectivity? In this challenging sociopolitical period where questions about European identity and inclusion dominate, this project aims to highlight the positive challenges of artists’ transnational collaborations. The artists share a commonality through their experimentation in confronting visible and invisible frontiers, cliches, contradictions, logic and illogic. These issues are interpreted through performance, video, sound, photography, printmaking processes, sculptural installations and place-specific interventions. Artists’ talks and performance take place throughout Ici et Là-Here and There. A symposium featuring Dutch artists-led initiatives takes place at University of Brighton Hastings on 26 September. 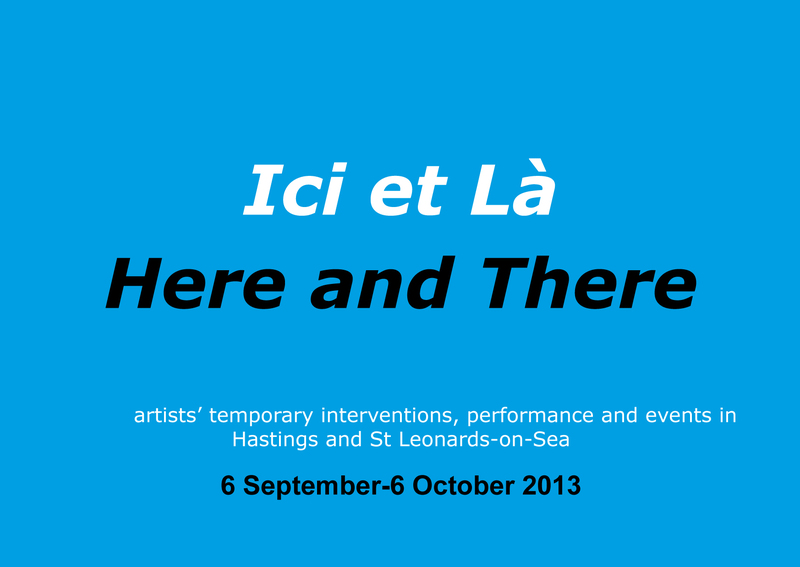 Ici et Là-Here and There is supported using public funding by The National Lottery through Arts Council England’s grants for the arts programme, Conseil Régional Nord-Pas de Calais, Communauté Urbaine de Dunkerque, Hastings and St Leonards Foreshore Charitable Trust, The Flemish Community, The Polish Cultural Institute London, The Polish Cultural Institute Paris, City of Dordrecht, Hastings Association of Twin Towns, University of Brighton Hastings and is realised in coordination with Hastings Borough Council. Les Grands Magasins takes place in Dunkerque 1 November-14 December 2013. During November, the artists will participate in empty shops residencies and from 1-14 December they will have related works in La Plate-Forme’s project space, 67/69 rue Henri Terquem, Dunkerque. The opening event at La Plate-Forme is 11.00 on Saturday 30 November and this is followed by a walking tour of the empty shops at 14.00.